with the big blue 1969 convertible "Stonewall Car"
'The Gay March' that virtually everyone said would never happen!! 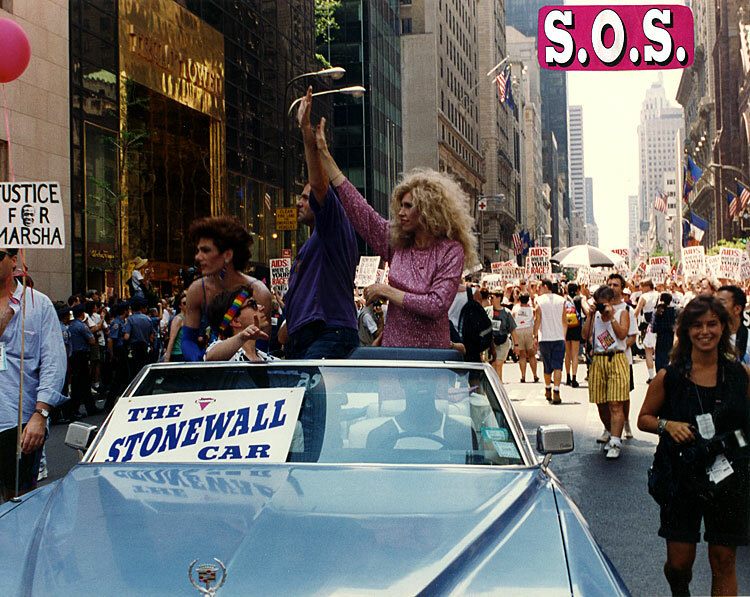 The great Gay history scene above with the "Spirit of Stonewall March" ("SOS") celebrating the remarkable 25th anniversary of the 1969 Stonewall Rebellion on Sunday, June 26th, 1994. The huge march as shown is almost at its completion on upper Fifth Avenue prior to arriving at the 'front doors' of Central Park. Pictured above are two members of the STONEWALL Veterans' Association ("S.V.A. "): grandly Queen Allyson Allante, also of the Imperial QUEENS & Kings of Greater New York ("IQKNY"), and John B. O'Brien ("JOB"), also of AIDS Coalition To Unleash Power ("ACT-UP")! The openly-Gay fellow in the car 'riding shotgun' wearing the rainbow headband is Andreas "Andy" Bahmann of Frankfort and West Berlin, Germany! Behind Andy is Stonewall veteran Beverly Bluegown, also of the S.V.A. and the IQKNY, wearing a spaghetti strap blue gown. It is a veiled Gay reference to "Alice Bluegown" (code term meaning the police) in the Stonewall Era! (Blue is derived from the color of NYCPD police uniforms.) The scene above was a multi-media street press conference and a strategizing pit-stop. That is why you see people standing in different directions. On the left in the photo is the towering Trump Tower and in the distance on the right is the landmark Empire State Building, both on Fifth Avenue. The sign "Justice for Marsha" refers to S.V.A. charter member and Gay Village character, Stonewall vet and transgender activist Marsha P. Johnson, who was found floating dead in the Hudson River after "Stonewall-23" just two years prior near the Gay people's Christopher Street pier. Mr. Randy Wicker, a Gay pioneer and active supporter of the S.V.A., created the sign and he is holding it. Marsha's death, although investigated by the NYCPD and ad hoc committees, remains a mystery and an enigma, just like the transgendered life of Marsha! a.k.a. When Fellow Gays Shamefully Ignore the Stonewall Vets, There's a Price -- or Two -- to Pay!! The historic 25th anniversary of the 1969 Stonewall Rebellion saw not one but two Gay, Lesbian, Bisexual and Transgender ("G.L.B.T.") marches in New York City. The "Spirit of Stonewall March" -- marching from Sheridan Triangle Park in the original Stonewall Club area on Christopher Street across Waverly Place through part of Greenwich Village and then, from the Washington Square Arch, all the way up Fifth Avenue and into Central Park at the Avenue of the Americas entrance -- was the real Stonewall March! 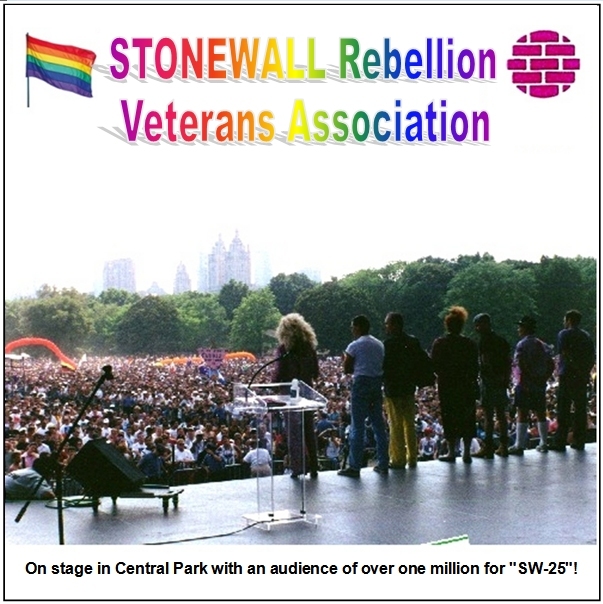 This historic march was sponsored by the STONEWALL Rebellion Veterans Association ("S.V.A. "), the AIDS Coalition To Unleash Power ("ACT-UP"), the Imperial QUEENS & Kings of Greater New York ("IQKNY"), the G.L.B.T. Political Coalition and the PRIDE Democrats of New York City -- and no other G.L.B.T. organizations! Not one international G.L.B.T. group! "It is the Gay Pride march that virtually everyone said ....could never and would never happen". The S.V.A., under the innovative leadership of its founder and elected president Willson L. Henderson, declared and promised that the march would happen one way or another, with or without arrests. NYC Mayor Rudy W. Giuliani and NYCPD Police Commissioner Bill Bratton are the two people who ultimately made eveything possible. Seasoned Judge Robert Patterson helped, too. So did civil rights attorney Norman H. Siegel, Esq. of NYC. The "Spirit of Stonewall March" did happen and it happened big time! Uniquely, this march had one only main vehicle the "Stonewall Car" and the SVA's trailer car for supplies, etc. The march was led by the classic and historic blue 1969 convertible with the big whitewall tires and the white leather interior also known as the "Stonewall Car". This monumental event in a word, to quote a number one Diana Ross & The Supremes' song of The Stonewall Club jukebox, "The Happening"! ACT-UP (AIDS Coalition To Unleash Power), at its zenith, was the driving force in making this alternate Gay Pride march happen. Unlike the 'official' "S/W-25" committee, ACT-UP had the approach representing inclusion of, respect for and consideration of the veterans of the Stonewall Rebellion -- the unquestionable sole reason that there is a "Stonewall 25"! This alternative march was clearly for the Gay people and allies not the corporate money interests. The bottom Gay line was that both the "Spirit of Stonewall" led by the S.V.A. and the "Stonewall 25" marches converged at the main entrance on West 59th Street to Central Park to evolve into the biggest Gay Pride Rally in history anywhere in the World! Queer Note: The "International Stonewall-25 Committee" incredulously referred to the community as "L.G.B.D.T."?! These soupy letters are shamefully historically wrong, besides stupid, and chronologically inaccurate -- especially on a long-awaited anniversary day of celebrating our true history. "Stonewall" the rebellion and the civil rights movement that was launched was inclusively about "Gay Rights", "Gay Power" and "Gay Unity" not 'Alphabet Soup' created a decade later by bored and boring revisionists. And, what in their "LGBDT" the hell is the "D"? Divorced? No! Dyke? No! It's Drag"! OMG! They were more whacked than we knew.... Can you imagine that people allegedly in the "community" -- though from California -- didn't know that "drag" (an unappealing word by itself) is considered part of the "Transgender" community? Obviously, not! Read their brochure. To "celebrate" (as in steal) the Silver Anniversary of the Stonewall Rebellion, this 'official', bureaucratically-organized, self-serving, overly well-funded but misappropriated, ad hoc, clandestine group thought of just about everything -- except the 1969 Stonewall Rebellion Veterans! Was the uprising computer-generated, asked SVA's Willson Henderson? Very little ever recognizes, nevermind honors, the people who created the "Pride"! This oddly concocted group -- an expanded version of the Heritage of Pride, Incorporated (they're very into incorporation) with some of the same cast -- used our "STONEWALL" event to rake in endless cash for themselves from Gay people and Gay supporters from all around the world but zilch for the founding Gay, Lesbian, Bisexual and Transgender ("G.L.B.T.") organization -- the National STONEWALL Rebellion Veterans Association ("S.V.A."). The S.V.A. represents the people, living and deceased, who actually made this historic event happen in the first place. They were the mostly kids who were regular patrons of the Mafia-owned and operated the STONEWALL Dance Club and Bar! In fact, with an out-of-control budget of millions of dollars, "the committee" did not even offer "gas money" (about $19.69) to fill up the tank of the historic 1969 blue convertible "Stonewall Car" which led the alternative Stonewall march into Central Park. Stop! The Stonewall International Committee including our local Heritage of Pride and company did not even invite the car! Rude! Dum! This ad-hoc group was so 'smart' that they 'voted' to hold the 'protest' against the symbolic United Nations ("U.N.") on a Sunday -- when the U.N. is always "closed"! Duh! "Meaningless" said activist Ann Northrop! We remember the era (not long ago) when Gay people still had a reputation for being courageous, well-dressed, attractive in some way such as hair or smile, and smart! That era has apparently and sadly ended! Marching on a place when you know it is closed is really ineffective and, quite Janely, simply stupid. There is absolutely no other explanation or excuse. For example, "Oh, we could not get a permit for a Monday". Huh? Really? The "alternate Gay march" did not have an authorized 'permit' for any day! In fact, we had no permit! Yet, we happened.... big time!! Why? Because the S.V.A., ACT-UP and the I.Q.K.N.Y., acting in unity, had the real "Spirit of Stonewall"! This likely once-in-a-lifetime G.L.B.T. happening story was originally covered in the New York Times and all other NY papers! "Two New York City Gay Pride Marches" described in The New York Times"
The New York Times about 20 years later, unfortunately, disabled this Stonewall Veterans "S/W-25" link along with 1,000 other links! by New York City Police Department professional estimates! Nearly 25 incredible G.L.B.T. 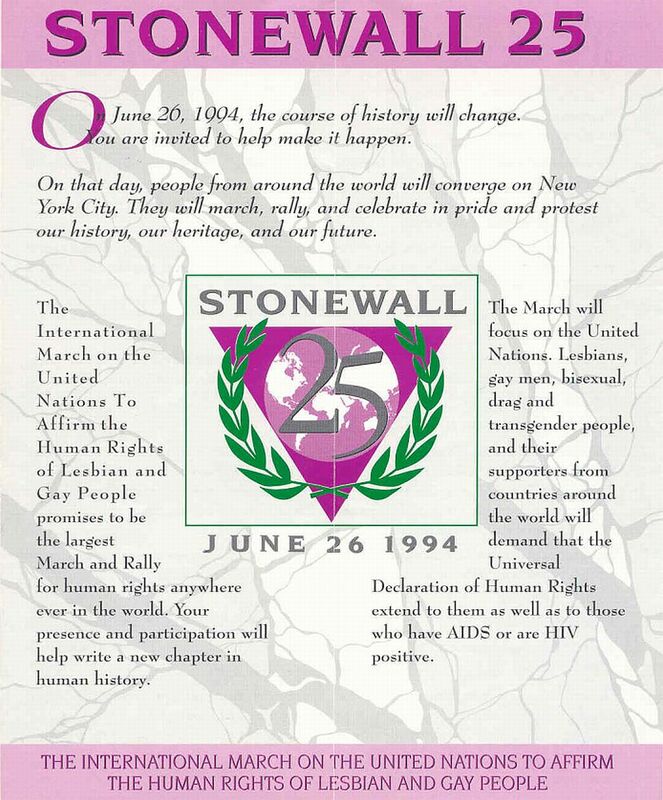 years since... "STONEWALL-25"! STONEWALL-50: "Spirit of Stonewall March, Part 2"
Sunday, June 30th, 2019 -- always "The last Sunday in June"